This is gonna be a good one. I mean, you know… we got Fat Tire hooking it up with multiple kegs, TONNNS of prizes from our sponsors with Eighth Inch hooking up a bike to win. What could be better? Also trying to drum up some funds for the North American Courier Cycle Championships of which Atlanta is the host city this year. 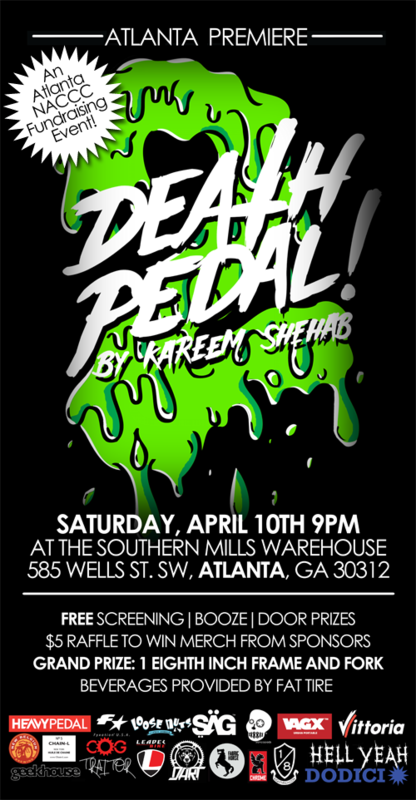 As with the other Death Pedal 2 Premieres, this will be the only one in this region (southeast). There really won’t be a lot of chances to see the film so I hope people don’t sleep on it! Read what I thought of the film here.